In an age when scientists have used controversial cloning technology to genetically reproduce beloved family pets, it’s little wonder that Fiat Chrysler would undertake similar efforts to revive a beloved and influential Fiat nameplate from its past. 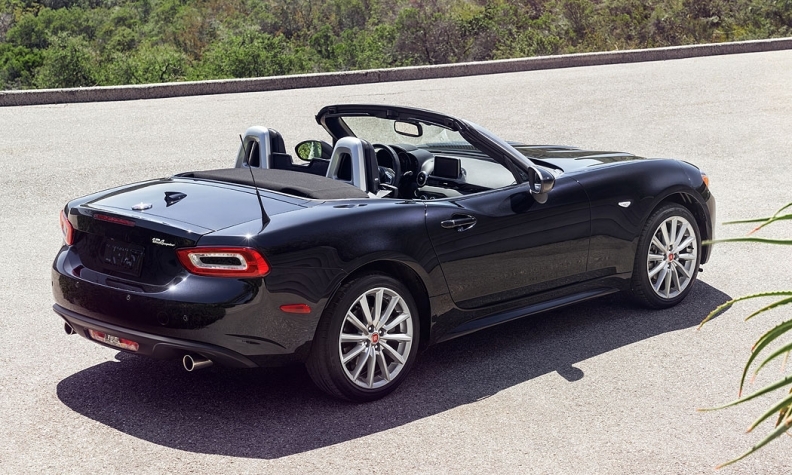 That’s essentially what FCA has done with the new Fiat 124 Spider revealed for the first time today at the Los Angeles auto show. 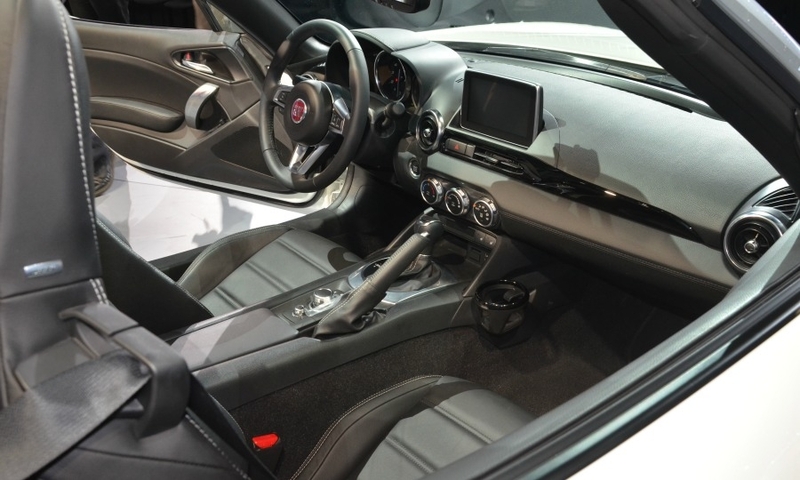 FCA has taken a donor car with an excellent pedigree -- the Mazda MX-5 Miata -- and grafted onto it a Fiat 1.4-liter turbocharged I-4 engine and styling to make it look like a proper descendant of the original Pininfarina-designed Fiat 124 that debuted in November 1966 in Fiat’s home in Turin. "There’s no better way to celebrate 50 years of the Fiat 124 Spider than to bring back this iconic roadster, pairing its Italian styling of the past with all of the modern performance and technology of today," Olivier François, global head of the Fiat brand, said in a statement. 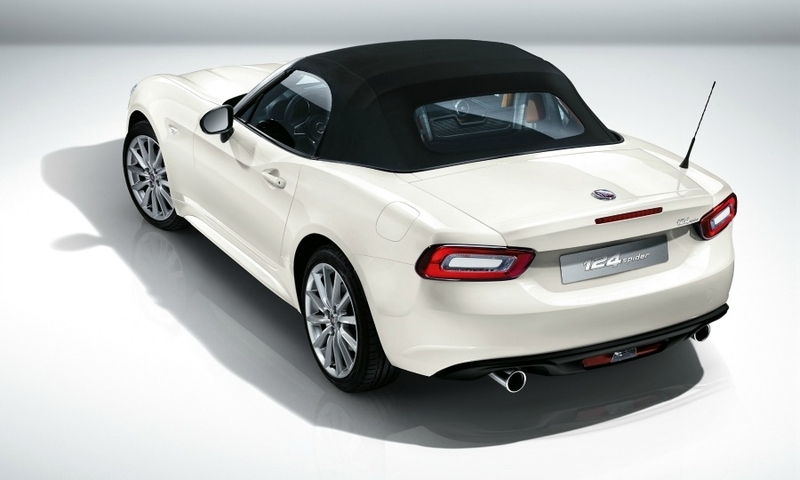 "The 124 Spider expands the Fiat family, bringing to market yet another head-turning, fun-to-drive vehicle for our customers." Though some have dubbed it the "Fiata" because of its Miata underpinnings, the Fiat 124 doesn’t share any body panels with its Mazda cousin. 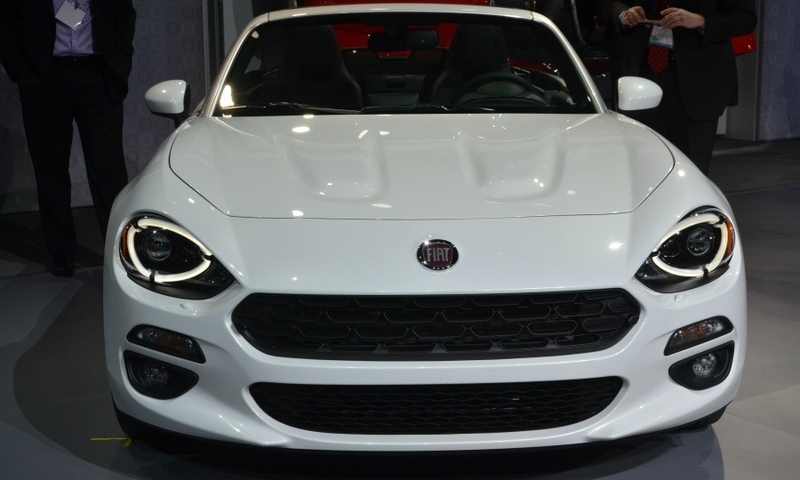 The Fiat 124 is longer, wider and half an inch shorter than the Miata, and its 160-hp turbocharged engine has five more horsepower than the Miata and produces 184 pounds-feet (250 newton meters) of torque, compared with the Miata’s 148. The Fiat is about 100 pounds (45kg) heavier, depending on the trim level, than its Mazda cousin. Both convertibles are available with six-speed manual or automatic gearboxes. The rear-wheel-drive 124’s suspension, like the Miata, employs a double-wishbone in front and multi-link in the rear to improve road dynamics and handling, and employs electric power-assisted steering. 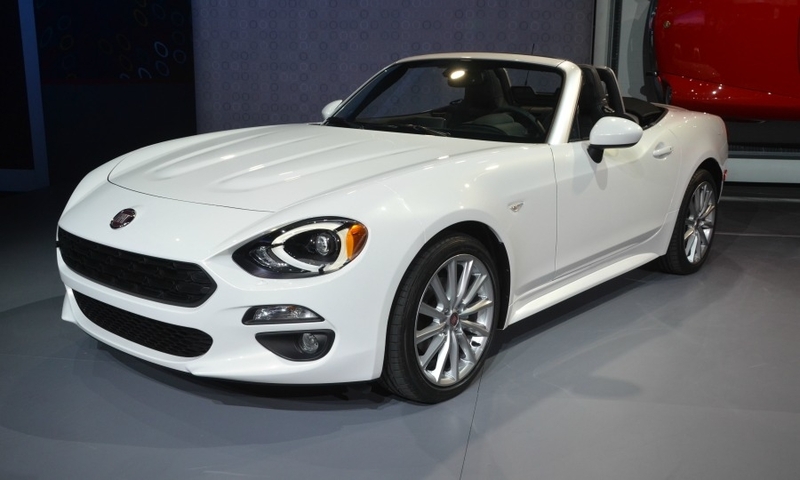 From a styling standpoint, the Fiat 124’s distinctive nose harkens back to the late-1960s roadster, with its bulging eyes and hexagonal upper grille. From the rear, distinctive tail lamps also recall the original 124’s horizontal lighting, while raised areas above the tail lamps bring back even more of the original Pininfarina design. 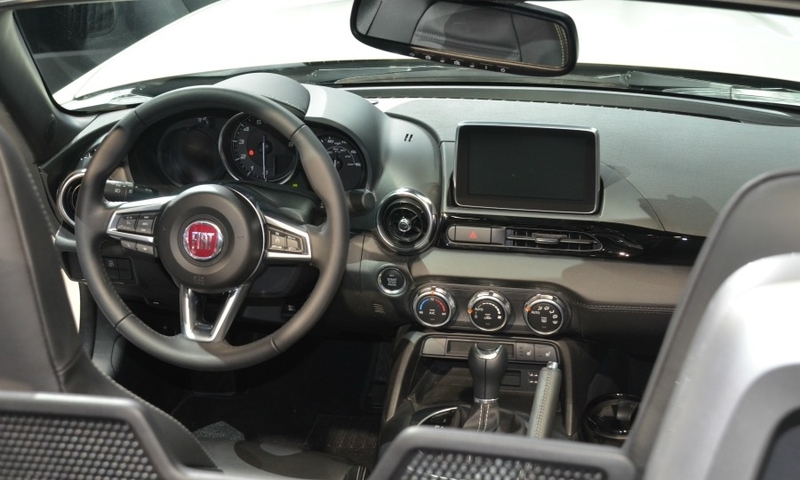 Inside the cabin, the differences between the Miata and Fiat 124 are harder to spot, excluding some different available materials and a different logo on the center of the steering wheel. 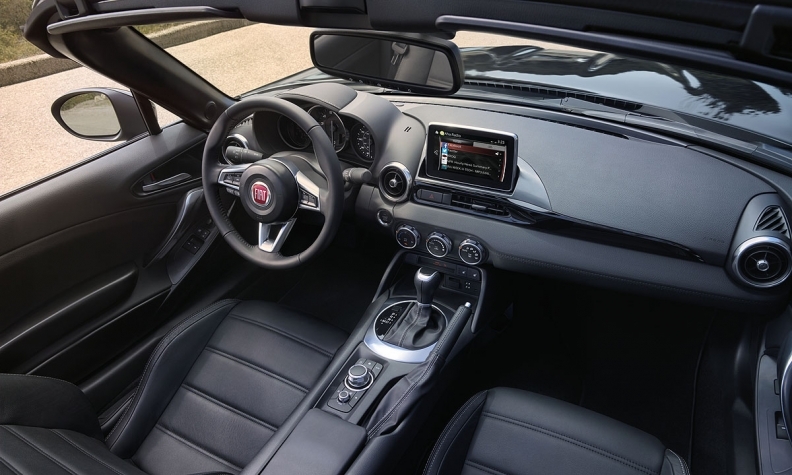 The 124 makes use of Mazda’s optional 7-inch touchscreen to house its Fiat Connect infotainment system. 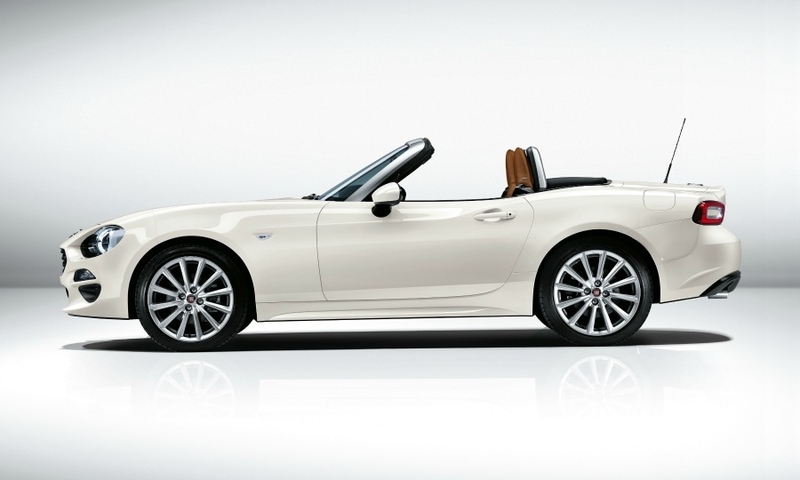 The Fiat 124 will come in two trim levels, the base-level Classica and upper-level Lusso. Fiat says that to celebrate the return of the roadster, the first 124 produced will be numbered and badged as a limited-edition Prima Edizione Lusso, and available only with Saddle leather interiors and Azzuro Italia blue. The 124 is being built by Mazda at its factory in Hiroshima, Japan, and will go on sale in Europe in May. 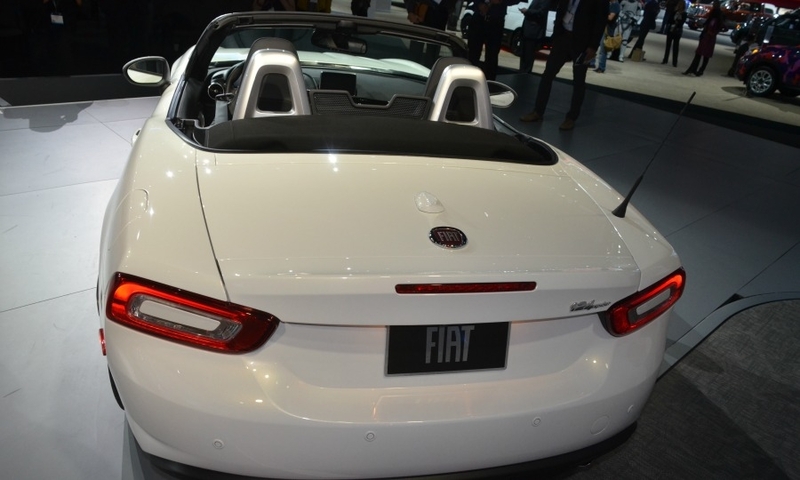 Fiat said it expects the roadster to be available in its 208 U.S. dealerships next summer. 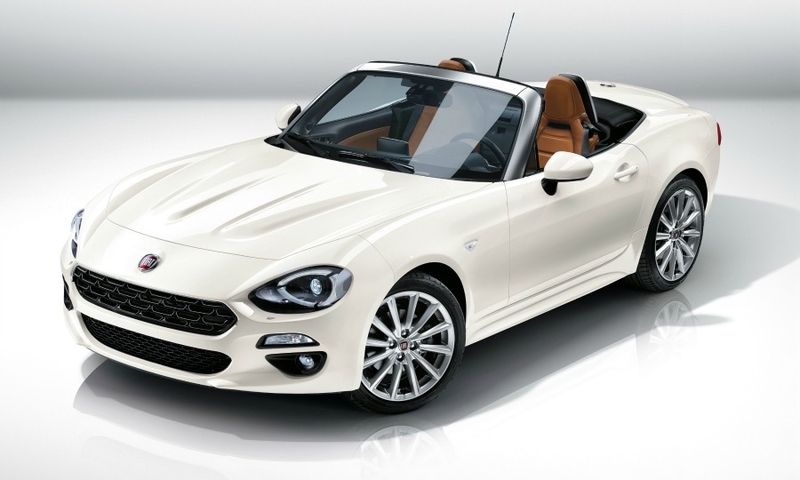 IHS Automotive forecasts that Fiat will sell about 12,000 units of the 124 Spiders annually including 6,000 in the U.S.